A regular summer resident and migrant; a small number of birds were regularly seen each winter through the 1990s. Since 2000 it has been reported only 4 of 16 winters. The Brewer’s Blackbird was an uncommon species during the Minnesota Breeding Bird Atlas (MNBBA). Restricted primarily to western North America, the northeastern periphery of the species’ range extends across the Great Lakes region. Highest breeding densities are found in the western Great Basin and coastal California (Figure 1). Assigned a Continental Concern Score of 10/20 by Partners in Flight and designated a Common Bird in Steep Decline. Populations in central Canada and the north-central United States are short-distance migrants that winter in the southern United States and Mexico; populations in western North America are year-round residents. An omnivorous ground forager that feeds on a wide variety of terrestrial insects as well as weed seeds and waste grain. An open cup that may be placed on the ground or in trees and shrubs; nests in colonies that number just a few pairs to more than 100 pairs. Breeding distribution and relative abundance of the Brewer’s Blackbird in North America based on the federal Breeding Bird Survey from 2011 to 2015 (Sauer et al. 2017). Prior to the 1900s, the Brewer’s Blackbird was principally a species of the western United States The eastern limit of its breeding range was considered the Red River valley of Minnesota. Indeed, Roberts (1932) wrote that the species was “abundant in the Red River valley since the earliest records for that region.” A species of open habitats, the western limit of the Eastern Broadleaf Forest was considered an ecological boundary. But as small communities, farms, roads, and cities expanded during European settlement, the forested landscape opened and Brewer’s Blackbirds began their eastward expansion. The birds were first discovered nesting in Minneapolis in 1914 and in Isanti and Sherburne Counties in 1915. When Roberts wrote his account of the species in 1932, the Brewer’s Blackbird had become a common breeding species in all but the most southern counties of the state and the extensively forested north country. A 1928 report of several colonies in Pine and Carlton Counties, as well as along the Iron Range in central St. Louis County, led him to speculate that this consumer of waste grain had followed the railroads north, and it was only a matter of time before it would be well established further north. At the time, confirmed nesting records (nests with eggs or young) were available from five counties: Douglas, Hennepin, Kittson, Marshall, and Polk. Inferred nesting (feeding young and fledglings) was reported from Isanti and Sherburne Counties. The range expansion witnessed in Minnesota was underway further east as well. By 1926, for example, observers documented an influx of birds in south-central Wisconsin (Williams 1958). Taking advantage of the clearing of the eastern forests, the spread of agriculture, and the construction of railroads and highways, Brewer’s Blackbirds moved nearly 1,200 km east across the central Great Lakes Region during the first half of the twentieth century, advancing at a rate of nearly 18 km/year. At the same time they also expanded their range into western Canada, moving nearly 300 km further north into the southern Northwest Territories (Martin 2002). By 1975, Green and Janssen reported that the species had become a breeding resident throughout the state, except in the heavily forested regions of the northern counties, from Lake of the Woods east to the Pigeon River. Despite its scarcity in this region, breeding records were available from Kittson County, east to Hibbing in St. Louis County, and from Tofte in Cook County. Brewer’s Blackbirds were also scarce south of the Minnesota River, particularly in the southwest. A few years later Janssen (1987) included a range map in his updated account that identified 19 counties where nesting had been confirmed since 1970. Hertzel and Janssen (1998) would later add one more county to the list; all but two of the 20 counties where nesting had been confirmed were north of the Minnesota River (Scott and Dakota). By 2014, field staff with the Minnesota Biological Survey documented 284 breeding season locations for Brewer’s Blackbirds. The majority of sites were in the northern half of the state and in counties bordering the Minnesota River Valley (Minnesota Department of Natural Resources 2016). The MNBBA participants reported 728 Brewer’s Blackbird detections in 11.4% (539/4,747) of the atlas blocks that were surveyed and in 15.6% (364/2,337) of the priority blocks. Breeding was confirmed in 126 of the surveyed blocks (Figures 2 and 3; Table 1). Reports were gathered from 72 of Minnesota’s 87 counties, and breeding was confirmed in 44 counties, including 8 south of the Minnesota River. One block with confirmed breeding straddled 2 counties: Carver and Scott. The species was most abundant in the northern Red River valley, including the Tallgrass Aspen Parklands Province. Otherwise it was scarce in the extreme southwest, southeast, and northeast corners of the state. The species is, however, fairly well established in a number of counties south of the Minnesota River, stretching from Dakota County in the east to Redwood and Yellow Medicine Counties further west. For a species found in open landscapes, which abound throughout all but the less settled and heavily forested counties of northern Minnesota, its sporadic distribution outside of the northwestern counties is somewhat surprising. Although it seems to have exploited some developed areas, including the Brainerd Lakes region of central Minnesota and the northern Iron Range, it remains an uncommon species throughout much of the state. The Brewer’s Blackbird’s range expansion in the first half of the twentieth century was facilitated by forest clearing and the development of transportation corridors (Martin 2002). Further range expansion since that time has been limited. Results from both the first and second breeding bird atlases conducted in Michigan suggest that “the initial surge during the colonization phase” of the early 1900s “has waned” (Chartier et al. 2013). 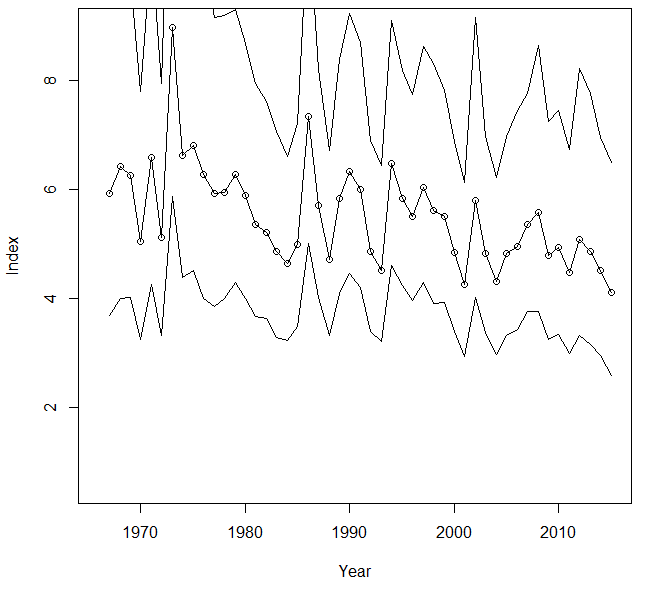 Ontario also witnessed a decline in the species occurrence in the province during the second atlas, suggesting that “numbers may now be stabilizing” (Cadman et al. 2007). Breeding distribution of the Brewer’s Blackbird in Minnesota based on the Breeding Bird Atlas (2009 – 2013). Summary statistics of observations by breeding status category for the Brewer’s Blackbird in Minnesota based on all blocks (each 5 km x 5 km) surveyed during the Breeding Bird Atlas (2009-2013). Summary statistics for the Brewer’s Blackbird observations by breeding status category for all blocks and priority blocks (each 5 km x 5 km) surveyed during the Minnesota Breeding Bird Atlas (2009-2013). Characterized as a species of open and semiopen habitats, the Brewer’s Blackbird is found in a variety of habitats from the western chaparral and sagebrush communities to eastern pastures, grasslands, and marshes (Figure 4). It is often closely associated with developed landscapes, including farmsteads, golf courses, sod farms, cemeteries, and city parks. Despite this diversity, Horn (1968) delineated three features that are characteristic of suitable habitats: short-grass foraging areas, perches where the males can watch for potential predators and monitor their mate’s activities (fence lines and utility wires often serve this purpose in agricultural landscapes), and suitable nest sites. In the Red River valley the majority of nest sites are located in small trees and shrubs, while further to the east and south, nests are placed on the ground (Roberts 1932; Martin 2002). Nest sites are frequently associated with a water feature, such as an irrigation ditch, a pond, the edge of a wetland, or a shrub swamp. This association is evidenced by habitat data collected within 200 m of MNBBA point counts where Brewer’s Blackbirds were detected. Although the predominant habitats were cropland and upland grasslands, both marsh/wet meadows and shrub wetlands were also present. Typical breeding habitat of the Brewer’s Blackbird in Minnesota (© Lee A. Pfannmuller). Habitat profile for the Brewer’s Blackbird based on habitats within 200 m and 500 m of point counts where the species was present during the Minnesota Breeding Bird Atlas (2009-2013). Data gathered by the federal Breeding Bird Survey (BBS) have generated a North American population estimate of 24 million birds (Rosenberg et al. 2016). A few years earlier, Minnesota was estimated to support 0.9% of the total population (Partners in Flight Science Committee 2013), which would place the current statewide estimate at approximately 216,000 birds. Although the species expanded its range eastward in the early twentieth century, the core of its breeding range still lies west of Minnesota (Figure 1). Some of the highest breeding densities have been observed in coastal California, where an average of 175 birds were detected per BBS route each year. This compares to an average of only 6 bird detected in Minnesota and 3 in Wisconsin (Sauer et al. 2017). Since wide-scale population monitoring began in the mid-1960s, the BBS has documented a long-term, statistically significant population decline averaging 2.25% per year since 1966. The decline has abated in recent years to an average annual decline of 1.43% per year since 2005 (Sauer et al. 2017). From 1970 to 2014, biologists estimate that the population experienced a cumulative decline of 61% (Rosenberg et al. 2016). Although populations in Minnesota are also declining, they have fluctuated widely over the same time span. Since 1967 they have demonstrated a relatively stable population trend (Figure 6). The species’ colonial habits lead to a clumped breeding distribution that is difficult to monitor. This, coupled with its relatively small population size near the edge of its breeding range, likely contribute to the wide population fluctuations seen in Minnesota. An examination of regional population trends illustrates that the Northern Great Plains is one of the few regions in the United States where populations are stable or increasing (Figure 7). This region includes the Aspen Parklands Province of Minnesota as well as an area in southern Minnesota just south of the Minnesota River where, as noted earlier, the species seems to be doing well given the number of atlas observations. Factors responsible for the species’ range-wide decline, however, are not well known. The species is not considered an agricultural pest during the breeding season, even though waste grains are an important food item. During the non-breeding season, however, Brewer’s Blackbirds closely associate with other blackbirds that do inflict significant crop damage. As a result, they are often inadvertently taken when other species are the farmers’ prime target. Indeed, Brewer’s Blackbirds are among the list of blackbirds that legally can be taken when they are causing, or are about to cause, crop depredation. It also is legal to take the species for the pet trade in Mexico, where many of the birds winter (Martin 2002). Population trend map for the Brewer’s Blackbird in Minnesota from 1967-2015 based on the federal Breeding Bird Survey (Sauer et al. 2017). Population trend map for the Brewer’s Blackbird in North America from 1966-2015 based on the federal Breeding Bird Survey (Sauer et al. 2017). The Brewer’s Blackbird has been assigned a moderate Continental Concern Score of 10/20 (Rosenberg et al. 2016). Although it is not a conservation priority at the state or national level, its steady and significant population decline for nearly 50 years has prompted Partners in Flight to list it as a Common Species in Steep Decline (Rosenberg et al. 2016). As noted earlier, the species does not occupy many landscapes that otherwise appear to provide suitable habitat, including many areas in southern Minnesota. Nevertheless, the state’s northwestern parklands appear to be an important stronghold for the species, and its status in this region should be closely monitored. The potential impact of warming temperatures on the species’ breeding habitat also warrants attention. A recent analysis of the impacts of climate change on nearly 600 North American birds classified the Brewer’s Blackbird as a “climate threatened” species, predicting that the species could lose more than 70% of its current summer breeding range by the year 2080. This may force a major northward shift into northern Canada and Alaska for the species to survive (Langham et al. 2015; National Audubon Society 2016). Horn, Henry S. 1968. “The Adaptive Significance of Colonial Nesting in the Brewer's Blackbird (Euphagus cyanocephalus).” Ecology 49: 682–694. Stepney, Philip H. R. 1979. “Competitive and Ecological Overlap between Brewer's Blackbird and the Common Grackle, with Consideration of Associated Foraging Species.” Phd diss., University of Toronto. Williams, Laidlaw. 1958. “Euphagus cyanocephalus: Brewer’s Blackbird.” In Life Histories of North American Blackbirds, Orioles, Tanagers, and Allies: Order Passeriformes, edited by Arthur Cleveland Bent, 302–334. Smithsonian Institution Bulletin 211. Washington, DC: U.S. National Museum.